Blu-ray may have officially won the high-def format war last week, but in a strange twist, the top selling high-def disc of the week was an HD DVD release. Yes, you read right. 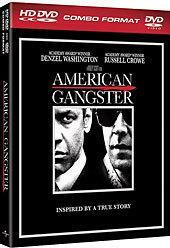 Universal's 'American Gangster' -- released on the same day that Toshiba announced it would drop HD DVD support -- topped Neilsen VideoScan's First Alert high-def disc charts for the week ending February 24, 2008, outselling the top Blu-ray release ('Michael Clayton') by nearly 2:1.